*Updated 10 October, with confirmation from Médecins Sans Frontières (MSF) that it has been “forced to terminate its provision of mental health services” on Nauru and all international staff have now left the island. Nearly 4,500 doctors and medical students had on Tuesday signed an Open Letter to Prime Minister Scott Morrison urging the immediate transfer of asylum seeker and refugee children and their families off Nauru for medical care appropriate to their needs. To be delivered to the Prime Minister next Monday 15 October, the letter has been signed by many high profile health professionals, including leading child psychiatrist Professor Louise Newman, mental health expert Professor Patrick McGorry, public health specialist Professor Rob Moodie, former AMA president and independent candidate at the forthcoming Wentworth byelection Professor Kerryn Phelps and former Australian of the Year Professor Fiona Stanley. 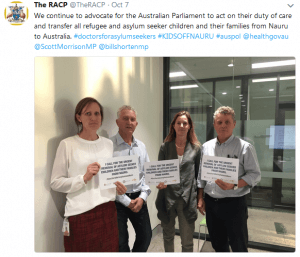 Dr Sara Townend & Dr Neela Janakiramanan, who initiated the letter (which is republished in full below with permission), warn the situation for children and families in Nauru is “deterioriating very rapidly” amid the news that the Nauru government had ordered Médecins Sans Frontières (MSF) to stop work there immediately. In stark contrast to the care for mental health espoused by the Federal Government when it announced on Sunday a new inquiry into mental health, both Morrison and Health Minister Greg Hunt have dismissed concerns about the MSF decision and declined to get involved. “The relationship between Medecins Sans Frontieres and the Nauruan government is a matter for them,” Hunt told ABC radio on Monday. The Open Letter notes that it is joining the call by more than 180 organisations to bring #kidsoffnauru. These organisations include leading medical groups: the Australian Medical Association (AMA), the Royal Australian College of Physicians, Royal Australian College of Surgeons, Royal Australian & New Zealand College of Psychiatrists, Australian College of Rural & Remote Medicine, Australian College of Emergency Medicine, Royal Australian College of General Practitioners, the New Zealand College of Paediatricians, the Australian Medical Students Association. Doctors and medical students can go to this link to sign up. 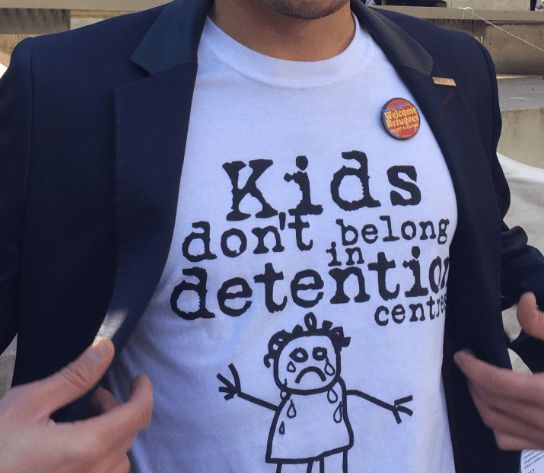 Other healthcare workers wanting to urge #kidsoffnauru can sign onto the GetUp campaign. We call on you to transfer the asylum seeker and refugee children and their families off Nauru for medical care appropriate to their needs. The medical situation is urgent for this vulnerable group of children. Medical experts, including doctors who have worked on Nauru, have spoken repeatedly about their concerns. They report widespread, significant deteriorations in physical and mental health. There are disturbing reports of young children attempting suicide by lethal means and withdrawing from their environment until they are almost comatose (increasingly called resignation syndrome). This is an extreme physical response to sustained psychological trauma, and is life threatening. A growing number have been transferred by order of the Australian Federal Court for treatment. We are aware that that there has been substantive investment by the Australian and Nauruan governments who provide health care on Nauru. We are aware that this includes provision of specialist mental health professionals including child psychiatrists. While we are grateful that these services continue to be extended, this will never bring resolution to these children’s symptoms. The circumstances of an involuntary and indefinite stay on Nauru directly contributes to their deterioration in mental state, which is why extending services on the island can never be the solution. We wish to state explicitly that our call to transfer should in no way be viewed as a negative reflection on Nauru’s population, government or physical environment. The severe adverse physical and mental health effect of involuntary and indefinite stays have been widely reported around the world. While we acknowledge the complexity of the situation, and that this in part results from a sincere desire to stop deaths at sea, we cannot accept that one policy necessitates harm to innocent children. Our peak bodies have repeatedly offered to work with the government to provide independent oversight and expertise. This offer was repeated as part of the AMA President’s letter that you received last week. We ask that you reconsider. We are deeply uneasy that expert medical recommendations are unheeded by our government. It is a dangerous precedent for other areas of great health need across our communities. It falls within our mandate as doctors and medical students to comment on and advocate for those requiring care within our health system. We undergo years of rigorous training and ongoing oversight to provide the Australian community with excellent medical care. We believe that this care should be delivered without regard for race, age, gender, ability level, or location. We call on you to show your commitment to the strong heath care system we have in Australia, which we are the guardians of, by accepting the recommendations of many medical experts and bringing these children and families to Australia so their health care needs can be met adequately, and with appropriate clinical oversight.